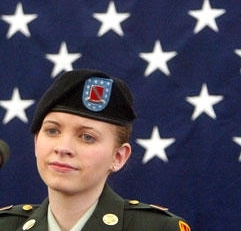 The Washington Post — the newspaper that brought the world the bogus hero-warrior tale about Jessica Lynch early in the Iraq War — placed at its Web site today a wire service report about Lynch’s completing an education degree at the University of West Virginia at Parkersburg. The 900-word report made no mention about the Post’s singular role in pressing the hero-warrior tale into the public domain but instead invoked the false narrative that the U.S. military made up the account about Lynch’s battlefield heroics to bolster support at home for the war. How arrogant: It was the Post that reported Lynch had “gone down firing,” that she had fought ferociously in the ambush of her unit, the 507th Maintenance Company, at Nasariyah in March 2003. It was the Post — citing otherwise unnamed “U.S. officials” — that presented the electrifying tale that Lynch had “shot several enemy soldiers” in the ambush. It was the Post that reported Lynch “continued firing at the Iraqis even after she sustained multiple gunshot wounds and watched several other soldiers in her unit die around her” in the fighting. It was the Post that said Lynch also suffered stab wounds in the ambush. Lynch never fired a shot in Iraq. Her weapon jammed during the ambush. She suffered shattering injuries not in battling Iraqi soldiers but in the crash of a Humvee as it fled the ambush. As I discuss in a chapter in my latest book, Getting It Wrong, the Post has never fully explained how it got the Lynch story so badly wrong. It has never disclosed the anonymous sources it cited in presenting the bogus hero-warrior tale. Indeed, the Post has largely sidestepped accountability for the bogus hero-warrior narrative, which has allowed the false narrative about the military’s concocting the Lynch story to take hold and proliferate. Loeb’s disclaimers notwithstanding, the notion that the Pentagon’s made up the story to bolster domestic U.S. support for the war makes little sense. The American public, after all, supported the Iraq War in overwhelming numbers in its early days and weeks, as I point out in Getting It Wrong. But it’s clear that if not for the Post’s erroneous reporting, the bogus tale of Lynch’s battlefield heroism never would have circulated as widely and as profoundly as it did.